A grandmother who spent almost five years completing an epic 20,000 mile global run has set off on a new challenge a little closer to home. Rosie Swale Pope is aiming to complete 27 marathons in 27 days. The 63-year-old started by running just over 26 miles in her home town of Tenby, Pembrokeshire, on Monday. Raising money for children's hospices she runs in Cardiff later, Bristol on Wednesday and 24 other towns and cities in England and Wales in coming days. All money raised will go to the Ty Hafan Hospice in Cardiff and Helen & Douglas House Hospices in Oxfordshire. She initially announced that she would be doing 26 marathons in 26 days and said: "I feel quite daunted by the 26 marathons but am determined to succeed. "I think it is a tragedy that children need hospices. One day, in a better world it won't happen. It is so very important that they can continue their work." On Tuesday, however, she announced that she would run an extra marathon in honour of her support crew. On each marathon she will be pulling the cart she used to pull her provisions and camping equipment on her during her round the world run. 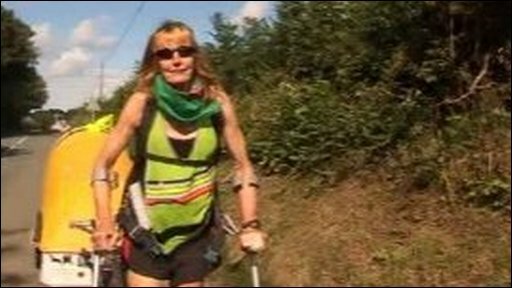 In 2008 she completed her adventure on crutches returning to Tenby almost five years after first setting off. With no back-up team and little funding, she ran through some of the planet's most remote and rugged areas. On most nights, she camped at the side of the road. Her route took her across Europe, Russia, Asia and north America.